Three days later, an open, empty bag still explodes with the swoon-worthy aroma of black truffles. What I bought as a lark, Torres Selecta Black Truffle premium potato chips, turn out to be, hands down, the best potato chips in the world. Made in Spain and distributed now to U.S. gourmet markets and through online sales, these “patatas fritas trufa negra” are pricey and worth every cent. I paid $2.39 for a small bag, and almost fell over when I ate the first one. The salty, crispy chips are flavored with real dehydrated black summer truffles, then powered-up with truffle aroma. At my first bite, alone on the street, I burst out with, “Oh my god!” ( I resisted the compelling urge to tell anyone who looked my way…”You have to try these!”) You might want to plead with your local market to bring these in through the Barcelona company’s U.S. distributor, or find Torres Selecta Black Truffle Potato Chips on Amazon. 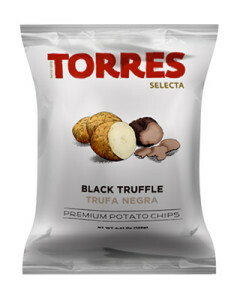 Could you please tell us what grocers we can by the Torres Black Truffle chips you spoke of from in the Connecticut area. I live in Hartford. I went to Amazon but there sell a basket for 65.00, I find that pill hard to swallow over something never tried before. i sell them in my store…JHORTON . they are 4 dollars.. but right here..
amazing how amazon can sell you at wholesale prices… sad for small businesses..
i also have CAVIAR chips… TORRES are amazing..